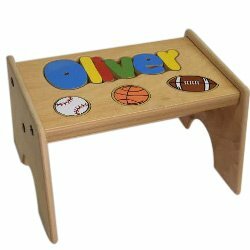 Personalized Sports Wooden Puzzle Stool- Stool Color: Natural, Letter Color: Primary, 1-8 Letters by babykidsbargains at Indsight. Hurry! Limited time offer. Offer valid only while supplies last. Learning is Fun This adorable step stool is a great gift idea for your child. Sturdy, useful and super fun for kids to play with over and over again. Learning is Fun This adorable step stool is a great gift idea for your child. Sturdy, useful and super fun for kids to play with over and over again. The puzzled letters of their name and fun sports themed symbols create an excitement for letter recognition and hand eye coordination. Choose the finish and letter color you like, and well create a wonderful item your child will love. If you have any questions about this product by babykidsbargains, contact us by completing and submitting the form below. If you are looking for a specif part number, please include it with your message.